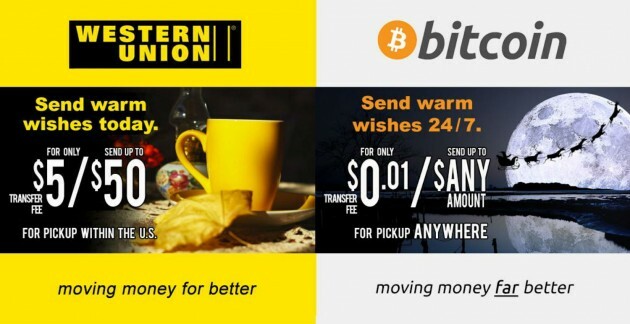 Western Union has reportedly taken action against a bitcoin spoof of one of its ads, triggering a backlash from proponents of the digital currency. The parody in question was an image posted on the ‘Bitcoin‘ Facebook page by bitcoin enthusiast Dave Aiello, who also placed it on Reddit. The spoof, which makes a humorous comparison between the price of sending money via Western Union and bitcoin, proved popular among Redditors, who were quick to share the image. It remains unclear where the parody originated, with Aiello indicating to Ars Technica that he is not the author of the image. Western Union didn’t find the image so amusing, it seems. The money sender filed a Digital Millennium Copyright Act (DMCA) claim with Facebook alleging the image infringed its copyright, forcing the social networking giant to take down the contentious content. Aiello told Ars Technica that Facebook had contacted him via email, telling him that the image had been taken down, with an explanation of the issue. The messages were passed on to the tech news site, allegedly identifying Erin Schol, assistant legal analyst at Western Union, as the person who filed the claim. Western Union told Ars Technica that it takes “all brand matters seriously” and takes steps it deems necessary to protect its intellectual property. However, the company’s representative did not wish to answer any specific questions on the matter. The site also reported that Facebook has informed Aiello that the image could soon be reinstated, unless Western Union files an action in a federal court over the image. DMCA notices are seldom filed against social media content, as parodies are usually considered permissible under the ‘fair use‘ doctrine. Comment and criticism are additional fair use arguments cited by Redditors, twitter users and authors who covered the takedown. Simply put, using copyrighted material for such purposes, for comic relief, commentary or criticism is normally allowed, otherwise meme makers would have nothing to work with. The takedown could be seen as Western Union reacting to the perceived threat posed to its activities by the digital currency, which offers as one of its selling points low-cost transfers of funds – although not in practice as cheap as the spoof indicates. In the end, the DMCA notice may end up being a Pyrrhic victory for Western Union, as the spoof in question might have gone unnoticed by the general public had it not been for the controversy. Vox described it as an example of the ‘Streisand effect’, a term that describes how attempts to suppress information in the Internet age often have the exact opposite effect: compelling more people to view and publicise the controversial material rather than less. In fact, the proof is in the pudding – you are looking at the image right now.